・The machine is developed for PV wafer making process cost down. 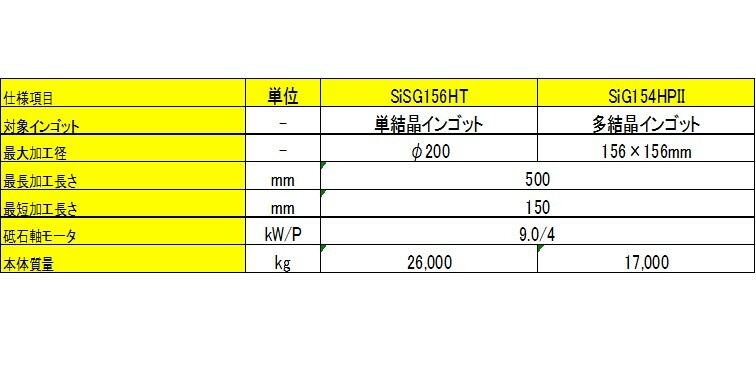 ・The technology of high accuracy flat grinding and low damage grinding based on semiconductor Si wafer gridding contribute to high yield of production during fixed abrasive wire cutting in the next process. ・Fully automatic Process squaring, rough grinding, fine grinding ,cleaning, drying, measuring in succession. ・automated output operation prevent human error. ・Easy operating, Ingot measuring and process recipe selection automatically, so can complete operation for setting the ingot on the stocker and just push the start button. ・After processing, ingot cleaning and drying function is standard which, prevent the Si sludge and water out of machine, and keep the clean working condition.